The Allison Transmission TC10 provides tractors with increased fuel economy without sacrificing on over all performance. With a TC10 installed tractors can operate at an average of 5% better fuel economy. Class 8 tractors no longer need to compromise vehicle drivability, transmission reliability, or performance. 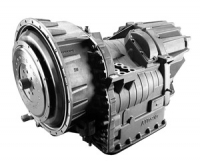 The Allison TC10 features an advanced torque converter as well as twin countershaft configuration with optimises acceleration and minimizes fuel consumption in city and highway conditions. A comprehensive test program conducted by Allison has proven that fleet users can achieve an average 5% reduction in fuel use when replacing a typical manual or automatic transmission. The Allison TC 10 overcomes differences in driving styles and the resultant effects on fuel economy by managing the response to driver inputs and optimizing gear shifts along the power curve. Advanced electronic controls offer a rich set of features which improve fuel economy and optimize transmission life through advanced prognostics. The TC10 these includes Load-Based Shift Scheduling, Vehicle Acceleration Control and the new Enhanced Converter Load Release. These electronic controls provide unprecedented flexibility when it comes to fuel economy. The advanced prognostics allow monitoring of a range of operating parameters in order to identify when service is required. This prognostics system reduced oil and filter changes without risking extra wear on the transmission. The TC 10 Oil Life Monitor calculated fluid life based on transmission usage and provides an alert when a fluid change is needed.